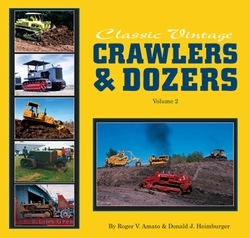 #2508-2 Clasic Vintage Crawlers & Dozers Volume II - "BACK IN PRINT"
Home > Books > #2508-2 Clasic Vintage Crawlers & Dozers Volume II - "BACK IN PRINT"
The second volume of the authors’ series of coffee table books discusses crawler tractors produced by Caterpillar from 1950 through 1979, as well as by Cletrac, Deere, Eimco, Euclid, Terex, International Harvester, and other manufacturers. Wheel dozers, manufacturers of dozer and crawler attachments, and railroad and circus usage of tractors are also covered. 256 pages, over 300 color photos, softbound.